Ask About Our Student Specials! 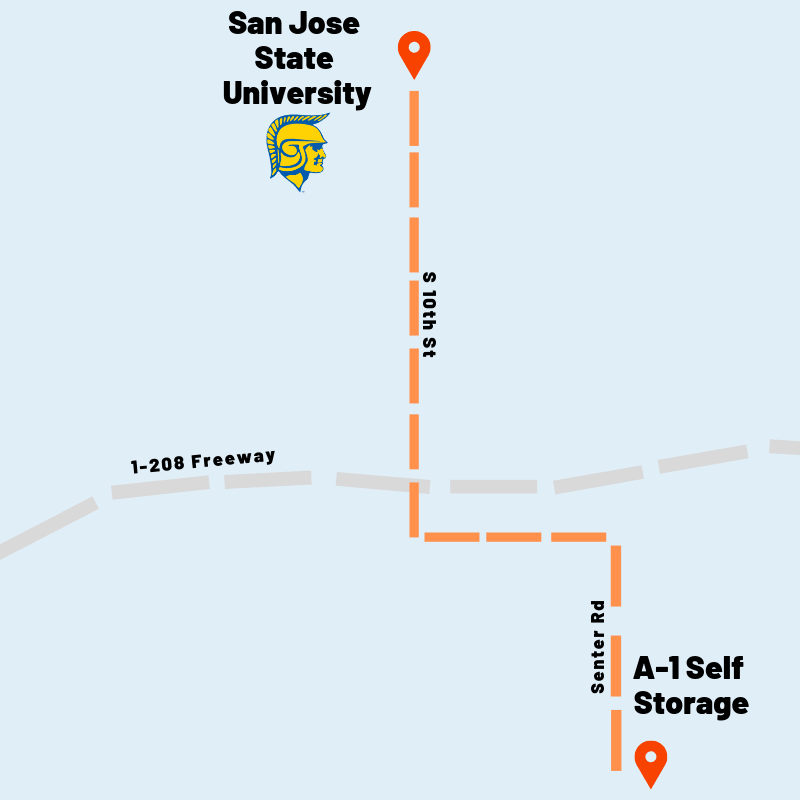 A-1 Self Storage welcomes students from SJSU! Believe it or not, it’s time to start thinking about storing your dorm room or apartment for the summer break. It’s either move it or lose it, Spartans! Conveniently store your belongings with us and enjoy your summer vacation. That way you don't have to drag it with you, and it'll be here when you get back. Sound easy? It is! Rent your storage unit online! Get your completed paperwork via email. We can work with your parents, too! Planning ahead is key! Taking the time to arrange for your summer storage early will make moving day less stressful. Inventory everything! It is so important to determine what you will need to store ahead of time, so you can rent the correct size unit. Our most popular unit sizes for student storage are 5x5 and 5x10 units. Those units are in high demand during the summer, so you’ll want to rent sooner rather than later! If you need help determining the right sized unit, check out our handy Unit Size Guide, or feel free to give us a call! Our friendly storage experts are always happy to help you choose the perfect unit size. Consult your residence hall advisor. Get your move-out checklist, dates, and details as soon as possible, so you can to start planning ahead and avoid unwanted surprises. Purchase packing supplies. We sell everything from boxes and bubble wrap to mattress covers. The earlier you get you packing supplies the earlier you can start packing any items you will not need in the next two weeks. Let’s be honest, during finals week you will not have time or energy to pack at the end of a long day. Come in during our office hours. You’ll be greeted by one of our friendly storage experts to help you through our quick and simple rental process! Show your photo ID, sign our rental agreement, purchase your lock, pack up your belongings, and you will be off and ready to enjoy your summer stress free! Here’s another useful tip, check-in on Yelp to get a free lock!